A little further out then we normally do a thread but signal strength and models can't be ignored, lol. For some just grazed by yesterday's storm, the excitement is palpable. While GFS and FV3 seem progressive and rush a N Stream wave thru in <24 hrs, I much prefer the 13/12z GGEM's portrayal of a slower more mature storm forming a bit south. Going to be a fun week. Let's roll.. Both the Euro/ICON slow this system down like the GGEM is showing and dig the storm a lot better. Nice to see 12z guidance thus far today painting a sweet west/east storm track and one that practically can have many of us again cherish in the snow dept. Might I also add, temps look ideal for higher snowfall ratios. Not to mention, the Lehs/LES set up for SE WI/NE IL/N IN is about as good as one could ask 5-6 days out on the models. A wide open lake with crashing 850's gives me goosebumps in terms of potential with this one. wow, ready to track the next one! This storm will have some strong winds to content with and also it will be a cold storm at that. Boy o boy, a very fun week coming up. I want to add also that after this big dog, brutally cold air follows. LRC says this one tracks further north than this past storm. The storm that hit Kansas the weekend after Thanksgiving produced blizzard conditions, the storm the following weekend hit my area. I just hope this time around it doesn’t go to far north!! With the NAO being neutral we should expect a west/east track. The remarkable consistency of the global models all showing this storm reminds me of storms from the past that we tracked before and how they all panned out. I do like the northerly track and would expect to see both you and Clint's are scoring a hit from this one. For some reason, this storms track reminds of the Nov 24th-25th Blizzard. It's not out of the realm of possibility this one gets wound up into one. Fun times tracking this week! Hopefully this pans out for us. Time to replenish the snowpack around here. You can rest assure, your seeing what I’m seeing amigo. This one has Bigly potential. With that in mind, looks like the 12z Euro came back north this run. Actually, I think this one looks more like the Super Bowl Blitz in ‘15 which is one of this years analogs. Check that, 12z Euro is the only model showing the southerly route....not quite as phased as it tracks east and almost sheers out a bit. For sure, tho iirc, the orig GHD storm was "seen" by the models further out, no? At any rate, you're correct in the type of ingredients and W to E track on this guy. GFS brothers continue to focus on the N energy and ignore and S snow swath. Yup, your right about the GHD-1 storm. I remember the Euro 9 days out showed a PanHandle Hook and then within 6-7 days, all the other models caught up. Similar situation here. Models certainly seeing the energy. How are you able to get an ICON snowfall map out to h180? TT cuts off about h120. My pay site also seems to stop there.. In regards to this cold storm, some record cold follows. More series of snowstorms thereafter. Hello Winter! UKmet at h144 leaning GGEM's way vs the progressive GFS portrayal. Am I seeing a foot there?! Yes, your eyes are NOT playing tricks. GGEM has widespread 12+ for even more of The Mitt but slightly north of our backyards. Attm, strength is more important than placement. That'll get dialed in as we go..
100% there is blizzard potential with this one. The pressure gradient is very stout with this system. Yes..would not be surprised at all as this major storm will be a windmaker. Strong pressure gradient HP will be to our west crashing w this LP will cause a very tight pressure gradient. I will be focusing attm on the ensembles as I think that is the best way to go. IMO, it is just too soon to get fixated on any one OP run. I find him to be, but whatever. Ricky from LOT talks up snow potential much more fwiw. Also, I'm not including warmista Met's that only begrudgingly mention a snowstorm after it's imminent. Those Met's aren't even "fair and balanced"
bring the swath of heavy snow across srn Lwr MI. 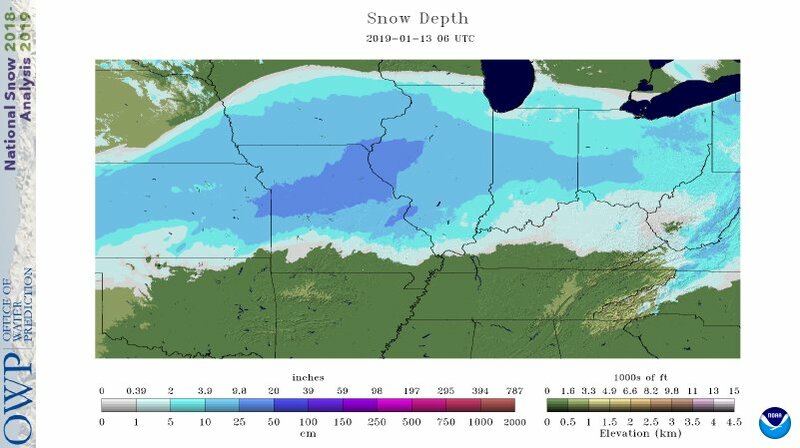 Hey guys, In regards to the track of this next system I just wonder what affects the current snow cover will have on the track? My light covering is melting under 32F and sun. 33F for a high tomorrow. This came after weeks or even months of warmth so it's covering unfrozen ground. I fully expect the southern end of this to shrink quite a bit by Friday morning, perhaps up to around I-70 in SIL on into SIN and SOH. Thus, it should not have much stopping a SLP from tracking that far north if it wants to. Hopefully tho, it could aid in keeping WAA at a minimum unlike the bare ground we started with back in Nov. That's my 2-cents. Others may feel differently. Wow! This could be another good one. And this time we will have amazing ratios with temperatures so cold. Even just .30 of QPF would give us 6 inches in that type of cold air! Wpc already jumping the chances for the next storm. Starting to get fun this winter. My dad is kinda freaking out because of the last storm. Worried about the weight of the snow collapsing the roof. My highs might now be getting outta the low teens for highs, if not colder. Nighttime lows will easily drop subzero IMBY, especially, w snowcover. Very cold air is poised to follow this storm. I can definitely see some record low temps being broken. Yes please, I got my snowmobile suspension all figured out. 13/18z GFS = same SLP in the P-handle but already 998 mb, couple deeper than that ICON above. EDIT - it's also 6 hrs later timestamp I noticed. 13/18z GFS = same SLP in the P-handle but already 998 mb, couple deeper than that ICON above. Oh that is looking good. 540 line well south and the low is looking beefy.